When Bob Marley’s widow, Rita Marley, sold her 2004 autobiography – No Woman Nuh Cry: My Life With Bob Marley – to The Weinstein Company as leitmotif for the first ever biopic about the Reggae Legend, Harvey and Bob Weinstein must have assumed Rita’s participation gave them automatic and carte blanche access to the rights of Marley’s music for the soundtrack. In fact, the Marley family announced last week that they did not license any of Bob’s music for the project, which the Weinstein brothers expected to enter production immediately. It comes as no surprise speculations are afoot and questions are hurled in abundance, particularly in the vicinity of the Marley family. Rudy Langlais, credited for his genius work on the film that won Denzel Washington his second Oscar, The Hurricane, is hand-picked to produce the dramatic expose of the life of the Reggae king, but the story begs for more questions as the fine prints of the contract indicates the African-American cinematic expert takes notes from Rita, whose name will appear on the executive producer high chair on the Marley biopic lot. Undoubtedly, a film about Bob Marley without his music is unfathomable and a certain commercial failure. Consequently, some critics already decided this is exactly the core of the squabble. 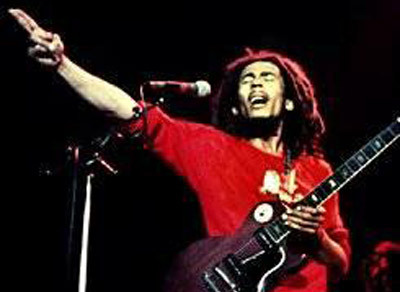 Weeks before The Weinstein Company announced its intention to create the Bob Marley film, decorated Hollywood film director, Martin Scorsese, also announced his intention to start production on another big screen depiction, starring the life and times of the 20th century’s most influential, musical icon. That the Scorsese project – a documentary – is different from that of the Weinstein’s, and that they are poised for release a year apart make little difference. They are both films, about the same protagonist and, will therefore, compete. Langlais himself advises, in Hollywood, the only colour that matters is green and the only letter that makes sense is B; bottom line and box office. Neither Scorsese nor the Weinsteins ascended to their current stature by settling for second place. As Rita’s input seems inextricably linked to the success or lack thereof, of the film based on her book, what does she, and her children, have to gain from holding out on granting the New York based movie company the rights to her late husband’s tracks? A lot – according to some critics. “We believe that this project is the best way to represent our father’s life from his perspective…any other film project pertaining to our father will be empty without his music to support it.”What cracks the melee wide open is that Scorsese’s project will be undertaken by Tuff Gong Pictures – like you had no idea every famous, musical family owns a film production arm? In association with Steven Bing’s, Shangri La productions, the Tuff Gong movie house has its sight set on publishing the documentary to commemorate Marley’s 65th birthday in February 2010. And yes, you guessed it, this is the project with the green light to use Bob’s and the Wailers’ tunes. If the critics are worth their salt, then, everything points to a negotiation ploy crafted by the Marley’s. The Weinstein biopic, No Woman Nuh Cry, will cut the finish line before the documentary – which is without a title currently – and by virtue of that single element, steals the best sales pitch; first ever Bob Marley film, first ever Bob Marley biopic, and clearly the first company to satiate the craving of Marley aficionados world-over; cha ching rings the Weinstein cash register, and they live happily ever after. Well, on condition they pay an exorbitant premium to claim the rights to the music. Aha! Utter bullocks, says the Marley family lawyer, Terri Dipalo. Rita underscores her attorney’s script by saying the real reason she has concerns about the biopic is that she was clueless the film would be fast-tracked. As to why the Marley matriarch envisioned a delay in producing the film is a quandary. The Weinstein company, a spin-off of Disney-owned, Miramix studios, is headed by two brothers with an illustrious reputation for doing what they do best, putting out movies: Derailed, starring Jennifer Aniston and Clive Owen, and Transamerica, starring Felicity Hoffman, to name a couple. To add salt to the Weinstein’s wound, Blue Mountain Music owner and Bob Marley’s music publisher, Chris Blackwell, thinks the biopic is a thorn in the documentary’s side. Not only does Blackwell says the biopic “jeopardizes” the Marley family-endorsed documentary, the Island Outpost head wants the Weinstein Company to press the breaks on the project by about half a dozen years. What if Bob and Harvey suggest Blackwell closes The Tides and allows the Tide Suites and limited edition accessories that decorate the Miami Beach resort to sit idle for six years? Something will have to give, and one movie house, perhaps after some sort of court proceedings, will have to take home the silver. Then again, there must be enough Bob Marley sympathizers on the planet to ensure a box office profit for both projects. Some people prefer to watch the life of the prophetic Rastafarian unfold through the lenses of his reality, and would, therefore, support the documentary. Others may be more intrigued by the concept of observing a Hollywood actor trying to deserve to step into the shoes of the Jamaican star, and opt for the biopic. Rolling Stone Magazine reports Rita tried to nail the lead roles for former Fugees headliner, Lauryn Hill, and her husband, Rohan Marley, Bob’s son from one of his relationships outside his marriage to Rita. Perhaps her attempts to make the biopic a true, family affair, was sidestepped as rumours are abound, Jamie Foxx, who won his first Oscar for his uncanny and riveting portrayal of Blues crooner, Ray Charles, is recruited to play Bob Marley. Foxx represented Ray in an exemplary rendition of the granddaddy of Blues, but that does not mean he will deliver the silver screen justice the Reggae pioneer commands. And as for Rita’s selections, having relations to the legend does not make them, by default, the best candidates for this groundbreaking film. Their involvement in the back-office is clearly invaluable but their combined filmography pales next to that of actors like Kerry Washington and Michael Ealy, for example, who are better prospects for the roles of Rita and Bob, and whose acting range alone would be a huge pull for those worried about a true and believable re-enactment of Robert Nesta Marley’s short but perdurable life. While the squabble over the commercialization of Bob Marley’s life’s work progresses, fans still wait with bated breath to exhale over a tub of popcorn, now twenty five years after Bob’s death. This commercialization – a concept the Reggae warrior himself detested and eschewed – only dampens, dilutes, and conflicts with the consolidated message that Bob Marley and The Wailers embedded within the DNA of roots, rock Reggae.